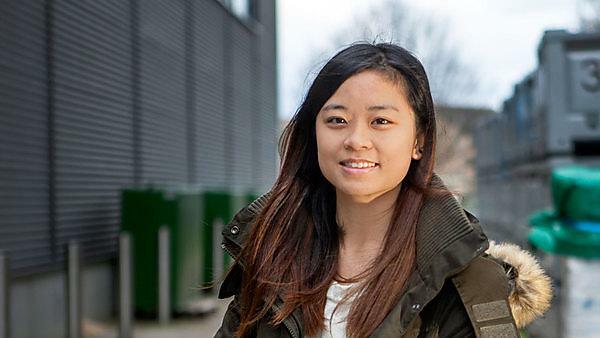 "I chose Civil Engineering because I love maths and physics very much. I am really interested in finding out how to construct buildings and I prefer to solve math problems more than writing essays, so I thought that engineering would be suitable for me. The different modules on this course enable me to experience many different aspects of the discipline. The modules include some coursework and project work that I find to be a more practical and effective method of learning. The location of Plymouth University is good. It takes around five to ten minutes to walk to my accommodation and to the city centre. There are also many fantastic facilities, especially the on campus library, which is open 24 hours a day and seven days a week. It is convenient for me to find a silent place to study. Plymouth can offer a lot of different foods and museums and many free activities. In comparison to other University’s in the UK, I have found Plymouth to be the most cost effective. What I also like about Plymouth is that there are many people from different nationalities and backgrounds, who I can learn from. This has helped me to adjust well to living in the UK, though the culture is very different I always remind myself to be patient and that it is ok to make mistakes. I do not expect to know all things immediately. I need to spend much time to adopt and understand the different cultures in the UK but whenever I feel confused, I know that I can ask for help and learn not to be shy. The Science and Engineering Faculty are so nice and approachable and the local students are also very helpful and help me a lot with my studies. I love the friendly atmosphere. Plymouth University offer lots of different sports and societies. I joined the University Dance Club and have attended the classes regularly in my spare time. I have also joined their annual show. I have learnt dancing before, so it is a good way for me to continue my interest as well as meeting new friends. To anyone considering studying at Plymouth I would suggest that they get stuck in and should not be afraid to make mistakes. The most important thing is to use the feedback from lecturers to improve on future assignments. Also, you should make time to join some societies that can provide your social experience. I have gained a great understanding of UK culture from living with people from all around the world and meeting new friends will improve my confidence further. Moreover, studying in the UK has made me more independent and more open minded about new challenges, which will prepare me for the future."